Wojtek Michalowski is a Professor of Health Informatics at the Telfer School of Management. He is a founding member of the MET Research Laboratory at the University of Ottawa, and Adjunct Research Professor at the Sprott School of Business, Carleton University. During the 1997/98 academic year, he was the Senior Research Scholar at the International Institute for Applied Systems Analysis in Austria. 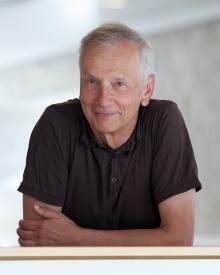 In 2013, the President of the Republic of Poland granted Dr. Michalowski the state title of Professor in recognition of his outstanding research accomplishments. This honour, the highest distinction given to researchers in Poland, comes at the recommendation of the Polish Academy of Sciences. Dr. Michalowski is member of several editorial boards and for a number of years he was a Chair of the Awards Committee of the International Society on Multiple Criteria Decision Making. His research interests include computer-interpretable clinical practice guidelines, decision analysis and medical decision making, clinical decision support systems, and computer modeling of interdisciplinary healthcare teams. He has written over hundred refereed papers and has published articles in many journals, including Management Science, Naval Research Logistics, Operations Research, Journal of Optimization Theory and Applications, IEEE Systems, Man and Cybernetics, IEEE Expert, Decision Support Systems and Electronic Commerce, European Journal of Operational Research, Methods of Information in Medicine, Journal of Biomedical Informatics, Healthcare Management Science, and International Journal of Medical Informatics. Dr. Michalowski is currently the Principal Investigator of an NSERC-funded research program. The research aims at making clinical practice guidelines applicable for patients with multiple diseases and developing clinical decision support systems for cross-platform applications. To learn more about this research program, visit www.mobiledss.uOttawa.ca. Fiallos, J., Patrick, J., Michalowski, M. and Farion, K. 2017. Using Data Envelopment Analysis for Assessing the Performance of Pediatric Emergency Department Physicians. Health Care Management Science, 20(1): 129-140. Lessard, L., Michalowski, W., Fung-Kee-Fung, M., Jones, L. and Grudniewicz, A. 2017. Architectural frameworks: Defining the structures for implementing Learning Health Systems. Implementation Science, 12(78): 1-11. Wilk, Sz., Michalowski, M., Michalowski, W., Rosu, D., Carrier, M. and Kezadri-Hamiaz, M. 2017. Comprehensive Mitigation Framework for Concurrent Application of Multiple Clinical Practice Guidelines. Journal of Biomedical Informatics, 66: 52-71. Halwani, F., Li, W.C., Banerjee, D., Lessard, L., Amyot, D., Michalowski, W. and Giffen, R. 2016. A real-time dashboard for managing pathology processes. Journal of Pathology Informatics, 7(24): 35. O'Sullivan, D., Wilk, Sz., Michalowski, W., Slowinski, R., Thomas, R., Kadzinski, M. and Farion, K. 2014. Learning the Preferences of Physicians for the Organization of Result Lists of Medical Evidence Articles. Methods of Information in Medicine, 53(5): 344-356. O'Sullivan, D., Doyle, J., Michalowski, W., Wilk, Sz., Thomas, R. and Farion, K. 2014. Expanding Usability Analysis with Intrinsic Motivation Concepts to Learn about CDSS Adoption: a case study. Health Policy and Technology, 3(2): 113-125. Wilk, Sz., Michalowski, W., Michalowski, M., Farion, K. and Hing, M.M. 2013. Mitigation of Adverse Interactions in Pairs of Clinical Practice Guidelines using Constraint Logic Programming. Journal of Biomedical Informatics, 46(2): 341-353. Farion, K., Wilk, Sz., Michalowski, W., O'Sullivan, D. and Sayyad-Shirabad, J. 2013. Comparing Predictions Made by a Prediction Model, Clinical Score, and Physicians: A Case Study of Pediatric Asthma Exacerbations in the Emergency Department. Applied Clinical Informatics, 4(3): 376-391. Michalowski, W. and Wallenius, H. 2013. Editorial: Special Issue on Behavioral Considerations in Developing and Applying Operations Research Models. Annals of Operations Research, 211(1): 491-492. Sayyad-Shirabad, J., Wilk, Sz., Michalowski, W. and Farion, K. 2012. Implementing an Integrative Multi-agent Clinical Decision Support System with Open Source Software. Journal of Medical Systems, 36(1): 123-137. Klement, W., Wilk, Sz., Michalowski, W., Farion, K., Osmond, M. and Verter, V. 2012. Predicting the Need for CT Imaging in Children with Minor Head Injury using an Ensemble of Naïve Bayes Classifiers. Artificial Intelligence in Medicine, 54(3): 163-170.